India's powerful labor unions called millions of workers out on strike Wednesday in protest of Prime Minister Narendra Modi's attempt to overhaul the economy. The unions, which claim to represent 150 million workers, are opposed to attempts to make it easier for companies to hire and fire. They're also demanding that Modi scale back plans to sell some state-owned companies. Some train services were affected by the strike early in the day, but there were no reports of major disruption to supplies of power, water or gas. Police in West Bengal -- a former communist stronghold -- bundled stone-throwing protesters into vans after they damaged public transport. There were also violent scenes in the state capital of Calcutta, one of India's major cities. Wednesday's strike came after the unions and federal government failed to agree on plans for privatization and changes to the country's rigid labor laws. Modi wants to replace 44 labor laws with four, and allow bigger companies to lay off staff without government permission. "We are opposed to any change that infringes upon the rights of workers," said veteran communist leader Gurudas Dasgupta. "As much as 70% of our workforce will be out of a job if these proposed changes are implemented. We will not let this happen," he told CNN. Dasgupta is general secretary of the All India Trade Union Congress, one of 10 organizations participating in Wednesday's nationwide strike. India is no stranger to labor disputes. Official data show India witnessed 127 strikes in 2009, around 200 a year later and 265 in 2012. The latest unrest comes at a critical time for Asia's third-largest economy. Related: Is a banking revolution coming to India? Modi was elected last year after promising to introduce reforms to boost growth in a country that still struggles with crippling poverty and illiteracy. But many of his plans have failed to materialize, mainly because of stiff resistance from opposition groups, farmers and unions. Modi has found it hard to introduce unpopular measures while his ruling alliance fights a series of regional elections. Last month, opposition groups in the country's parliament managed to stall the government's bid to modernize and standardize taxes. The annual rate of growth slowed to 7% in the three months that ended June 30, down from 7.5% in the first quarter of the year. 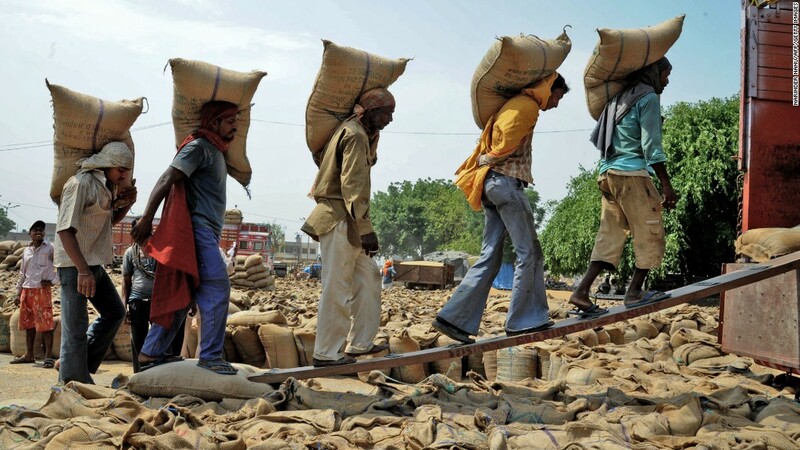 Economists say India's restrictive labor laws are holding growth back and stifling job creation. Last year, the World Bank ranked India 134 out of 189 economies in terms of ease of doing business.